The original compact, lightweight, multi-use, travel coffee filter. 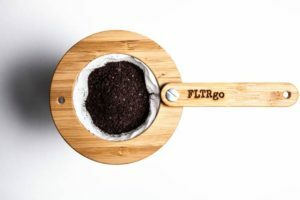 The FLTRgo Travel Coffee Filter is the perfect companion for every coffee-loving adventurer. With the FLTRgo, you will never be without a quality cup of filtered drip coffee. Organic cotton fabric filter with overlock stitching. Aluminum screw hinge & aligned holes on ring & handle. Reusable, washable, compact, and collapsable. 4 1/2 in. (116mm) diameter and 1/2 in. (13mm) thickness when folded. Approximately 4 0z (13 g).